“You can read the content very quickly (because they don’t contain much information) and they have a unique look. I also think that word clouds can provide useful information for SEM or SEO planning. But people are fooling themselves if they think that a word cloud offers a satisfactory summary of hundreds or thousands of pages of text,” he wrote. 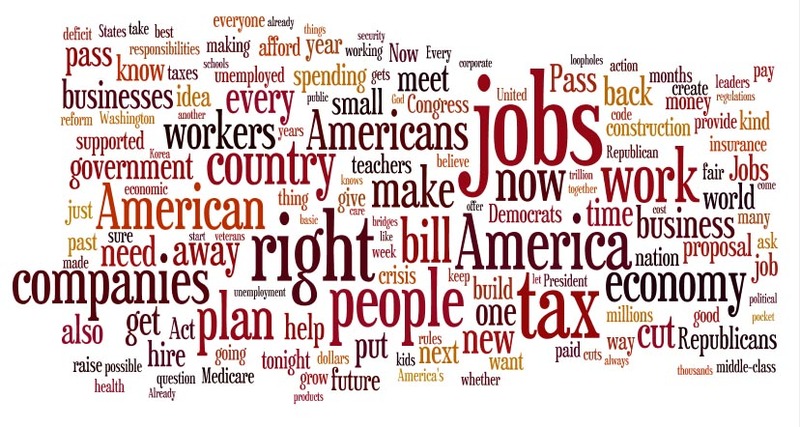 NYU political science PhD student Drew Conway has a similar, but different beef with word clouds. Conway looked at a word cloud, essential a plot of words in three dimensions (x, y, and font size), and saw a missed opportunity. “They are meant to summarize a single statistics—word frequency—yet they use a two dimensional space to express that,” he wrote. His solution came from his background in statistics, which oftentimes compares two sets of data. 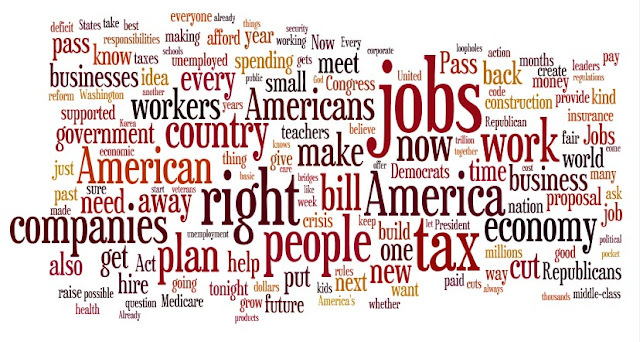 For his improved word cloud, he compared two speeches by political figures and used the x-axis to describe the similarity between two speeches. To accomplish this, he used the free, open-source statistical programming environment R, which has a data-mining and graphics plotting features, along with some custom coding. But what to compare the Obama jobs speech to? That same day, bankers and business executives at the Economic Club of Minnesota waited eagerly to hear the Fed Chair Ben Bernanke outline what the Fed would do to alleviate economic concerns. Obama and Bernanke were speaking to two very different audiences, and had different objectives. Obama was speaking to a Congress hell bent on being re-elected and an anxious, under-employed American public. Meanwhile, Bernanke was speaking to titans of industry and banking. These differences shouldn’t be an excuse not to compare the two speeches; rather, both speakers are components of the administration weighing in on essentially the same issue. Differences in their speeches could signal a difference in opinion and discord about an appropriate response, while similarities could point to ideas with a measure of political support. If nothing else, it’s worth looking at how two high-ranking officials in an administration tailor speeches on economic issues to two different audiences. Here’s what those two speeches look like in Conway’s “better word cloud.” Click to see the plot in a higher resolution. © 2013 Matthew Schroyer. Powered by Blogger.